Madison is the perfect city for anyone looking for a youthful, collegiate-type of downtown, but adores the outdoors. It's a highly-rated city for its emphasis on quality living: 12.7 parks per 10,000 residents, excellent air quality, and a large community focus on bicycling (there are more bicycles in the city than cars!) Also, there is cheese. So much cheese. 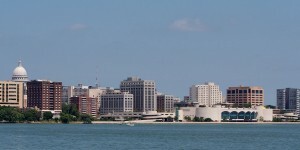 The city is often reviewed as being a cultural hub of the Midwest. The amount of music talent that passes through is astounding, so it is no wonder that it is considered second to only Austin as the city with the most concerts per capita in the U.S. Also, with four lakes surrounding the city (Lake Monona, Lake Mendota, Lake Wingra, and Lake Waubesa), any type of outdoor-loving individual will have more access to the natural world than they will know what to do with. If you're a pet owner, Madison's pet-friendly, natural environment will be even better for your explorations. You will find the University of Wisconsin located just along Lake Mendota basically in the heart of the city. The effect of 40,000 students? A very strong college town vibe. In addition, downtown is a hotspot for millennials looking for urban living. Throw in a bounty of large and powerful downtown employers (Madison is known for its high employment), and you are left with a very youthful culture and upwardly mobile residence. As you can imagine, college students make up one the largest demographics of the city. With both the University of Wisconsin and Edgewood College right in the center of town and only a mile away from one another, you'll find lots of students living in Greenbush, along Campus Drive, Monroe Street and everywhere in between. Try using an apartment guide to find all of the best cheap apartments for rent, homes for rent, and for those lucky enough, the utilities included apartments that will keep your school costs low. If you are moving to the area to work at the capital and have the budget to afford one of the best urban neighborhoods in Madison, you have to check out First Settlement. Aptly named, First Settlement is the OG of Madison's residential settlements. The neighborhood has a nice blend of pure downtown urbanity with parts that slide into more a residential feeling with tree-lined streets. Your living options vary from houses for rent, fine condos, apartments for rent in historical complexes and new, luxury apartments. Though, good luck on your apartment search for a studio apartment: they go fast. It's no secret that you will really learn what winter is like when you move here. So, all out-of-staters take note: it gets cold. Really cold. When the average high in January is 26 F and the average low is 11, you can expect that your heating bill is going get pretty high (keep an eye for an all bills paid apartment by using an apartment finder to bypass these added costs). However, the summers are beautiful and having four complete seasons in such a beautiful area has its bonuses. RentLingo is your trusted apartment finder in Madison. We hire local experts, such as former property managers and locators to anonymously tour and consistently rate and review every available place. They share their honest and unbiased perspective with you, so you know how every rental ranks in the area. Because our experts tour every property, we can offer consistent apartment ratings across every region. So unlike finding a Backpage or Craigslist rental, you can trust these apartments are verified and trustworthy: whether it's a cheap studio or a one bedroom with all utilities paid all the way up to a nice house for rent or a luxury condo.